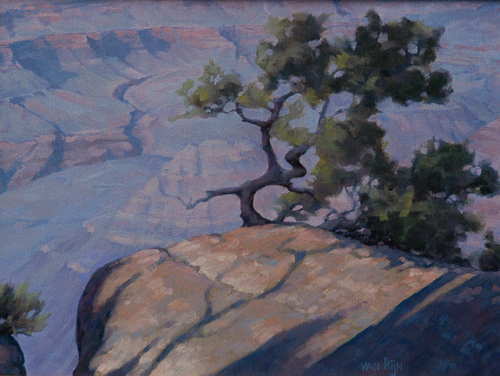 Eva van Rijn — Kiesendahl + Calhoun Fine Art, Ltd.
"What inspires me about canyons is the frightening drop..."
9 x 12, oil on canvas. 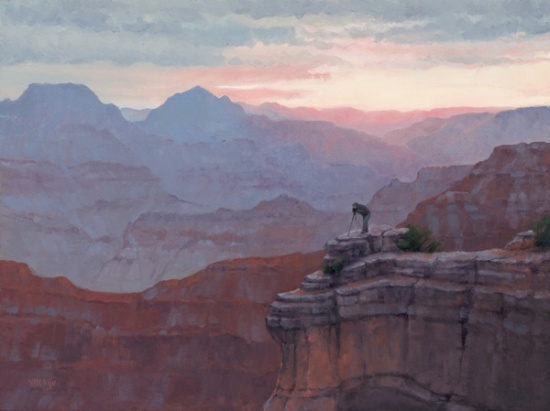 "What inspires me about canyons is the frightening drop, the ever changing colors of empty space, the way my mind wants to float into distance. At first it was hard to make my feet approach the edge. I had a sense of awe that I hope is captured in my paintings." I WAS BORN IN DEN HAGUE, HOLLAND IN 1936 AND EMIGRATED TO THE UNITED STATES WITH MY PARENTS DURING WW2. MY FAMILY MOVED TO WOODSTOCK, NY WHEN I WAS EIGHT, AND I WAS INSPIRED FROM AN EARLY AGE BY THE EXCITEMENT AND CREATIVITY OF THE WOODSTOCK ART ENVIRONMENT. I TOOK A YEAR OFF FROM COLLEGE TO STUDY AT THE ACADEMIA DE BELLE ARTE IN FLORENCE, ITALY, WHERE MY MOTHER HAD BEEN A STUDENT BEFORE ME. AFTER COLLEGE I MARRIED PAINTER-SCULPTOR EDWARD CHAVEZ, AND ABSTRACT ARTIST, AND WHEN OUR DAUGHTER MAIA (NOW ALSO AN ARTIST) WAS IN COLLEGE I STUDIED ART AND ART HISTORY AT YALE UNIVERSITY.